Nathan Fillion, star of the never-should-have-been-cancelled TV Show “Firefly” and current star of “Castle” is in the market for an electric car and he thinks he might have just found it. 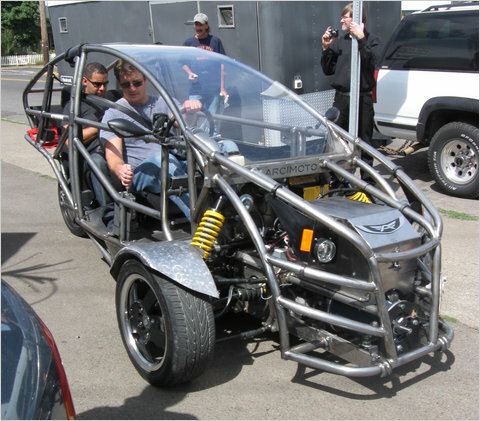 It’s called the Arcimoto Pulse and it’s a little different from your run of the mill Tesla Roadster. After sending out a tweet to his 600,000 followers saying “I think I’ve found my spaceship” the celebrity electric car enthusiast crashed Arcimoto’s website with the ensuing traffic spike. The Pulse is licensed as an electric motorcycle due to its 3-wheel configuration and has a top speed of 65 miles per hour and uses lead-acid batteries rather than the more commonplace lithium-ion, the use of the cheaper lead acid batteries is going a long way towards keeping the cost down to an estimated $17,500 USD however the range is limited to just 40 miles per charge.